An ideal instructional kit for calligraphy and lettering, this starter kit makes learning beautiful writing easy. Contains three "C" style pen nibs (C1, C2, C3), perfect for Roman Gothic alphabets, Italic alphabets, accented line drawings, scrolls and scripts. Nibs are designed with reservoirs that allow for uninterrupted ink flow. 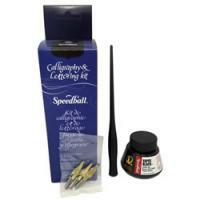 Kit includes 1 2-ounce jar of super black India ink, 1 Speedball pen holder, and lettering tips and instructions.